The façade and the bell tower of San Marco in Florence. Among the artworks, the most ancient is a 14th-century crucifix in the counter-façade. The crucifix on the high altar is by Angelico (1425–1428). In the first altar to the right is St. Thomas Praying by Santi di Tito from 1593, while on the second altar is a Madonna with Saints by Fra Bartolomeo. The Last Judgement, by Fra Angelico. 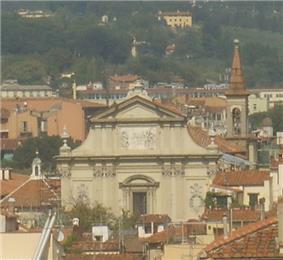 The museum houses the major collection of works by Fra Angelico. Panel paintings included the Deposition executed for Palla Strozzi, the San Marco Altarpiece commissioned by the Medici in 1440, and a Tabernacle of the Linaioli (1433–1435) whose frame was designed by Lorenzo Ghiberti. There are also a great number of small frescoes by Angelico and his assistants in the monastic cells and a number of larger frescoes including the Annunciation. His masterwork is the complex Crucifixion in the Capitular Hall, finished in 1442.